This listing is for a Boutique Grosgrain Ribbon Cheerleading Hairbow! FUNKY & FUN! These are hand-made by me! 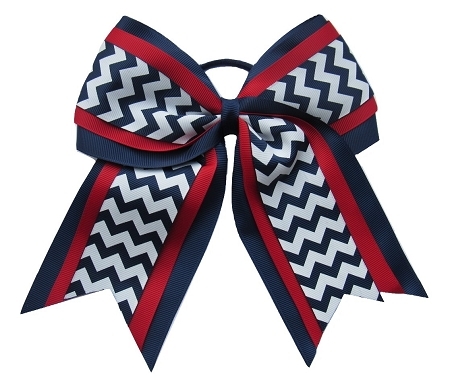 The Hairbow is made out of navy blue, red, and navy/white Chevron Print premium 3 inch grosgrain ribbon! These Boutique Bows are approx. 7 inches in length and 7 inches wide. Cheer Bows are attached to a stretchy elastic hair tie! Great to wear at Atlanta Braves, Arizona Wildcats, Houston Texans, or Boston Red Sox sports games! Perfect for Cheer Practice, Football Games, Pageants, Cheerleading, Gymnastics, Dance, Vacations, Birthdays, and more! Your daughter will love these bows! Check out my store for other hairbow colors & styles! This Bow is BRAND NEW! All items are from a pet-free and smoke-free home!